Spice up your next meal with the taste of Southern Louisiana cuisine. 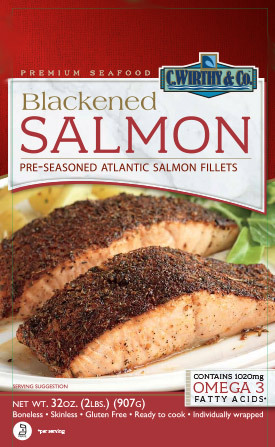 Our Blackened Salmon is coated with world-renowned Chef Paul Prudhomme's "Magic Seasoning Blends" so you're guaranteed a perfectly prepared meal each and every time. They can dress up your every day salad or give your fish tacos a new flavor twist. Nothing could be quicker, easier or more impressive than these mouth-watering fillets. All of our salmon producers have all or some of the certifications listed here. To find out more about these certifications click on the icons.